Multi-Sensor Thermal Security Cameras In Networked, Outdoor Dome Enclosures. Fully enabled for control and operation over IP and serial networks, D-Series systems deploy a 320 × 240 thermal imager along with a day/night 36× zoom color CCD camera. 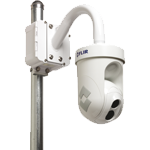 FLIR’s D-Series thermal multi-sensor security dome cameras are the perfect replacement for day/night dome cameras, providing clear 24/7 imaging capability in an attractive, discrete dome-style enclosure.